As a Licensed Dispensing Optician for the past 8 years, this question has presented itself countless times. The longer I am in this industry the more I begin to realize we are doing our patients an injustice if so many people have no idea how non-glare lenses can help them to see better. As I scan the internet, I find myself reading blogs of people out there looking for answers and coming up empty-the conclusion they quickly come to is it’s all hype and a marketing strategy. We have developed a rapport amongst eyeglass wearers as being salespeople first and professionals in the industry secondary, if at all. There are a few facts I like to discuss with potential patients in the dispensary. What I find, is a failure to explain that during a refraction (the part of the eye exam where the doctor acces visual acuity) the lenses that are used (which is better 1 or 2) ALL have a glare free property. Why you ask? Because the doctor is finding the solution for BEST visual acuity. Doctor’s are not looking for vision that is good enough or will get a patient by. Once a patient leaves the exam room, they leave with the expectation of being able to see as well with their glasses on as they did in the exam room. And they are absolutely correct, with properly fitted eyewear and the best visual solution for that patient, they should. It is my priority as an Optician to help each patient see to the best of their ability, and if I fail to use a lens with a glare-free property, I am doing that patient a huge disservice. 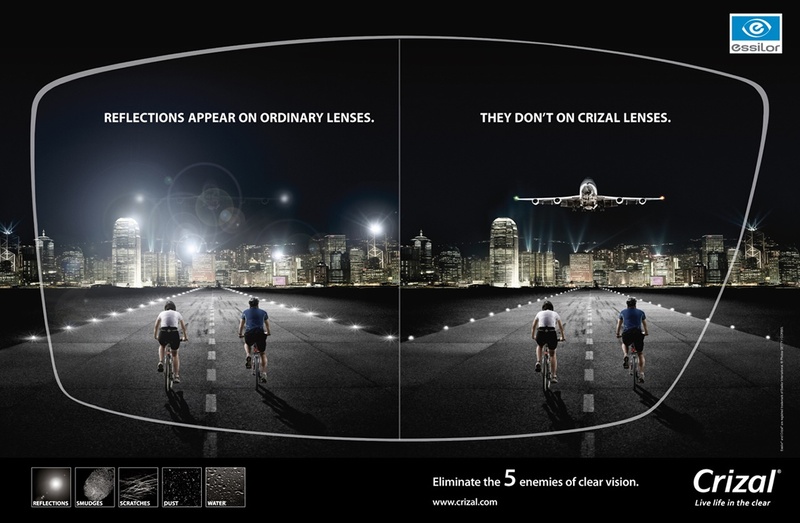 Glare free lenses provide the patient with supreme clarity in their vision. In addition to aiding in fatigue from eye strain caused by fluoresce lighting and white boards, headache’s, halo’s around lights, and cosmetics, glare-free lenses can now take it a step further and prevent the leading cause of blindness in the US, age related macular degeneration. We have become a society of texting, tablets, and surfing the web on the go. We are incessantly checking e-mail or using social media. As the time we spend increases doing these activities, so does the chance of developing age related macular degeneration. The blue light that is emitted from high resolution screens found in cell phones, tablets, computers, and TV’s is doing severe damage to the eye. The newest glare free product on the market is able to filter out the harmful blue light, thus preventing age related macular degeneration, while at the same time allowing the helpful blue light that regulates eating and sleeping patterns into the eye. Eyewear is purchased because we want to see better and be healthy, the choices we make for lens technology should reflect that. As for myself and my co-workers, we recommend some type of glare free property to each and every patient and explain the benefits in great detail. In return we have grateful, happy, return patients that come to us not only to find a stylish pair of eyewear, but to be able to see with impeccable clarity. Visit Crizal’s Website for more info. 2 Responses to What is non glare and why do I need it? Thanks, I’m glad you are enjoying our blog.